Jason Dufner, following the completion of his win at Sunday’s PGA Championship, slumped into his chair in the media room. He had the brim of his cap down low, shoulders dropped, eyes droopy and a voice that remained on the same one octave. Looking at him it was hard to imagine the man had just won one of the four majors played this season on the PGA. He had won his first ever major, shooting an impressive two under par round of 68 to end the four day tournament at 10-under par beating fellow American Jim Furyk by two shots. 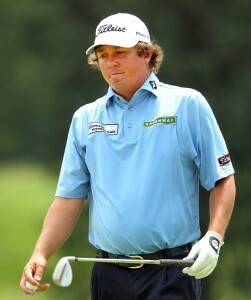 Someone in the media asked Dufner if he could name other athletes, he knows that seem to lack a pulse. Dufner replied probably no but said other sports usually are somewhat more exciting than ours. He said there are home runs in the game of baseball, three pointers in basketball and big downfield plays in football. That he said would get him pumped up, but for him golf was a bit boring, as its very matter of fact. One reporter asked what his game plan was after taking a two-stroke lead early in the final round. He replied he just wanted to keep moving forward without screwing up. Of course, his responses had been unscripted and honest, not what the PGA might want to hear, but that is why he is the people’s champion. His hair is scruffy, his stomach roundish and he played a big part of the final round with a wad of chewing tobacco tucked inside his lower lip. It is amazing how he has gone under the radar for as long as he has, but underneath his indifference is a player who cares much about his sport and his ability to be successful in it. He has for a long time studied videos of Ben Hogan and has wanted to emulate his swing. His route to the championship has only included two wins in 193 starts, prior to Sunday.